KidznSnow :: Insider's Tip - Get the new iTunes Cowbell App for the Olympics! With the Olympics in full swing, excitement over the Games is high. Whether your son or daughter likes to ski, snowboard, ice skate, play hockey or sled, or just likes to play sports, the Winter Games provide an optimal opportunity for parents to talk with their kids about the success that can be found through hard work and a lot of heart. The Olympians also set an excellent example of what you can accomplish through physical fitness. 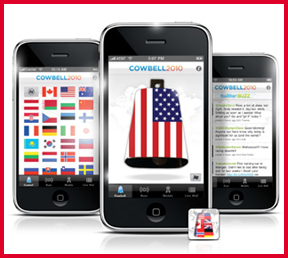 One way to help our children enjoy the Olympic action is a new iPhone App developed just for the games called Cowbell2010 (www.cowbell2010.com) that recently launched in the iTunes Store. As you might have guessed, it's a virtual cowbell that can be wrapped in any country's flag you choose, then (and this is the kids' favorite part) rung loudly to support the Olympic athletes. Ringing cowbells is an old Alpine tradition that started because it’s hard to make noise clapping in mittens and gloves. The next time you’re watching the Games and hear the bells ringing in the background, you can tell your kids the reason why. In addition to the fun, visually appealing cowbell, the App has the complete event schedule updated for your timezone so kids can decide what event they want to watch after dinner; a real-time medal count by country that lets them see which country is in the lead; and a live Twitter feed of more than 200 Olympians so kids can see what Apolo Anton Ono eats for breakfast (he really does Tweet about it). The App sells for .99 in the iTunes store.